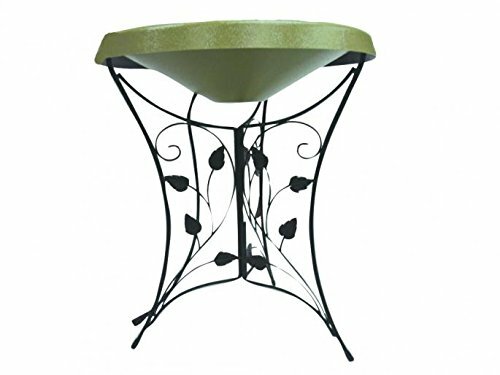 The handsome Birds Choice Ivy Pedestal Heated Bird Bath makes your backyard a cozy spot for birds this winter. This heated bird bath ensures birds will always have a place to flock and drink. It's made of recycled ABS plastic and features a three-legged stand with delicate ivy detailing. About Backyard Nature Products Humble beginnings in 1993 have yielded wonderful results for Backyard Nature Products. Founded by Dan Bloedorn, the company began by offering simple backyard bird-feeders built by Dan and has since expanded to include feeders for multiple animals, outdoor furniture, bird baths, bird houses, and more. Now, Backyard Nature Products has its own facilities and team of dedicated employees. Environmentally conscious, poly-lumber (made from recycled milk cartons) is used in a number of their products and any wood scrap is recycled into mulch. Whether you want a decorative accent or a functional place for your feathered friends to feed, Backyard Nature Products has something for you. Dimensions: 20L x 20W x 24H in.. Constructed from 50% recycled ABS plastic. Choose from available colors. Thermostatically controlled heater. 3-legged ivy leaf pedestal. Made in the USA. If you have any questions about this product by Birds Choice, contact us by completing and submitting the form below. If you are looking for a specif part number, please include it with your message.